There's a new Card menu, with a single command, Clear Card. Choose the command to start fresh. It empties the text box above the card image, and the image itself, as well as the text box in the left margin, under the hamburger icon. The image is replaced with a message asking you to drag an image there. And now that there's a menu there, we may add some more commands. The development of RSS support in Little Card Editor continues. There's now an orange RSS icon on the screen, just below the card display, to the left of the font popup menu. That of course is where your feed is stored. Here's a link to my feed. Each card has a landing page, that's linked to from the feed. Example. As before, only items that flow to Twitter are included in the feed. This change, while it appears small on the surface, was fairly significant in the software. If there is any breakage, the time to find it is now. If you see any problems with the feed, or settings, post a comment here, let me know. Later, it may be harder to find/fix problems. In this release of Little Card Editor every user gets an RSS 2.0 feed. Only items that are sent to Twitter are represented in the feed. Each item has an enclosure that points to an image for the card. Here's an example, the feed for my tweet stream. This is the first step in the conversion of LCE to be a server-based product. In Little Card Editor v0.60 you can use any Google Font in your cards. There's a new command in the Font menu that lets you enter the name of the font you want to use. The font is dynamically loaded through the Google Fonts API. In this card I'm using the Luckiest Guy font. I have been told more than once that I am this guy. And I agree that I am! One more thing, the "Grumpy wizards.." text is what they use to demo each of the fonts. I thought it would be appropriate to use it to demo this capability in LCE. 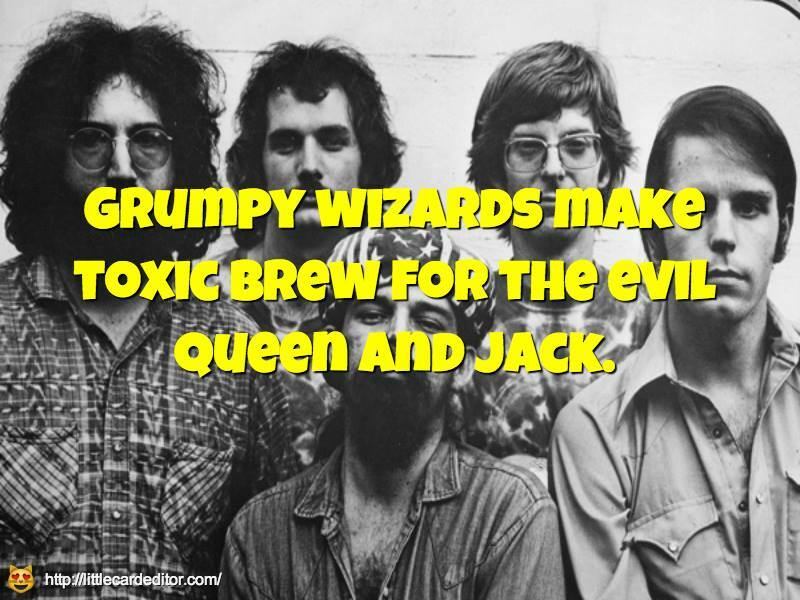 Particularly over the pictures of Jerry Garcia and Pigpen and the rest of the early Dead, thinking they probably would like being thought of as Grumpy Wizards. You can set the shadow color, shadow depth in both height and width, and shadow blur. You can control horizontal and vertical alignment: left, center, right -- top, middle, bottom, all combinations. The caption text and the message text can be different. You can set the fill color, for images that don't fill the canvas. Choose any Google Font for your headline text. Best feature of it all is that the product gets no more complicated for newbies. Most of the new features are in a sidebar, which is hidden behind the "hamburger" icon in the upper left corner of the Little Card Editor home page. Just click on the icon and all the advanced controls become visible. If you want to have the tweet text and the text over the image be different, enter the tweet text in the text box, and LCE will tweet that instead. If you leave it empty the text over the image and the tweet text will be the same. This was probably the #1 feature request, for good reason. There's no need to include hashtags and username in the text over the image, that belongs in the tweet. Now there's an easy way to do that. You can easily change the alignment of the text by clicking in the next group of radio buttons. All the controls are live, meaning the rendering of the graphic changes immediately when you click the control. Font size and line height control the size of the text and the width between each line. You can change the shadow color and the fill color. Use light shadows on dark backgrounds, and dark shadows on light backgrounds. Shadow offset determines how "deep" the shadow appears, and blur softens the shadow. The bigger the number the deeper and more soft the shadow. Again, the controls are live, so when you enter a number the rendering updates immediately. The color popup that used to be in the lower-right corner of the canvas has moved. It's now in the sidebar, accessible through the hamburger slider in the upper-left corner of the page. It's in the group labeled Text, shadow, fill colors. There's a new command at the end of the Font popup in the lower-right command that allows you to enter the name of any Google font. Some good ones: Lobster, Indie Flower, Libre Baskerville, Pacifico, Bree Serif, Alegreya, Crafty Girls. This only works with Google's fonts, we make a call to their API to dynamically load the font. You must also spell the name correctly. Otherwise you'll probably get Arial (depending on your browser and OS). I added a link to Google Fonts in the Docs menu in LCE. If you have questions about the new features, please ask them in a comment below. Hope you like the new version of Little Card Editor. There's a new menu for fonts in Little Card Editor just below the canvas, next to the color menu. I asked two friends David Biedny and Cori Kesler, both who work with fonts, what would be some good ones. I put those in the menu and added one of my favorites, just to play. I just want to test the functionality -- does it work? And get feedback on other fonts that would be good to put in there. I can use any of the Google Fonts. There are lots of them. Here's an example of a card that uses one of the new fonts. If you have any ideas re fonts, please post a comment. Everyone wants the ability to start a new line in a Little Card Editor post. I do too. But I didn't want to hack it in, I wanted to do it right. I think you'll agree it was worth the wait. You'll notice that the text area at the top of the canvas is now a little taller. You can type more than one line in the text area. You start a new line in the natural way, hit the Return key. That will force a line break in the text on the card. You can see the result in this little poem I wrote about the famous developer of Netscape, venture capitalist, tweetstormer and all around great guy, Marc Andreessen. That's it, nothing more to say about the feature, other than it seems to work! A few nice-to-have features in Little Card Editor v0.53. New setting determines whether the image is stretched to fill the canvas, or clipped. The default is clipping. This stuff is complicated (or at least it is for me, at this time) so the algorithm may need more tweaking. But it's better in this version than it was in the last. Screen shot. You can now use Little Card Editor on an iOS device, such as an iPhone or iPad. To add an image, click the camera icon below the canvas. A dialog appears asking if you want to take a new picture, or choose one from the scrapbook. The icon also works on other platforms, and brings up the file chooser for the environment it's running in. Screen shot. There are menu items in the Docs menu pointing to this changes page, and to the Twitter feed for cards. With this change you can now use LCE on an iPhone or iPad. But we still have work to do to make it work well on these platforms. Remember the product is all of two days old. We now have a dedicated feed on Twitter with all the Little Cards. Your cards should show up there within a minute of posting. PS: And this creates a connection betw Little Card Editor and Happy Friends. PPS: An RSS 2.0 feed with the cards as enclosures. If you have questions about Little Card Editor this is a great place to post them! Welcome to Little Card Editor! Here's a page of examples of Little Card Editor posts. They're all exactly the same size (by design) and follow a familiar pattern. You can change the color of the text. And there are some settings that allow you to do a little customization. But it's designed for simplicity. Not to be too much. Just enough. Go to the Little Card Editor site. You're transported to Twitter, where you can give Little Card Editor permission to access your account. See the section below that explains how and where we store your credentials. Find a picture you want to use and save it to your local disk. Drag it onto the box in Little Card Editor. Type some tweet text in the box at the top of the page. Click the Tweet This Card button below the box. There are a lot styling options in the left sidebar. You can open it by clicking on the icon in the upper left corner of the page. More information on it are in the update notes for v0.60. Starting with version 0.54, you can publish cards using either Twitter or Facebook or both. If you want to use Facebook instead of Twitter, visit the Settings dialog, which is accessed through the menu at the right edge of the menu bar. In the first panel, Platforms, uncheck the box for Twitter and click OK.
And of course choose Sign on Facebook instead of Twitter. We don't retain any information about you, nor do we retain any ability to post to Twitter, or read anything from your Twitter account. That information is stored locally only on your own computer. You can erase it simply by signing off. I'm a little afraid of how much din a person with Little Card Editor can create. So try to remember, especially at first, that you're also repping the product, and a new activity on the web. Let's be careful out there! I have a load of ideas, but first, let's see how it works. Does the server scale? Are people creative with it? The users will drive the process, as always. With the limits of technology. Many thanks to Chuck Shotton and Dan MacTough who helped me through the most difficult parts of the coding. Rendering on the client side, and getting pictures through Node into Twitter are fraught with difficulties, mostly due to scarce docs. But we did it. These guys are my best programming goto friends. Thanks! By Dave Winer, Sunday, November 2, 2014 at 11:31 AM.